In the summer of 2007, the hotel was honored with a visit by His Imperial Highness the Crown Prince, present in Saga to attend the opening ceremony of the National Inter-High School Championships, who came to the hotel for lunch. On that occasion, we refurbished this room to serve as a resting room for him. We imported from Bali a canopy bed, and transformed the room into a room for couples that features the exotic air of an Asian resort. 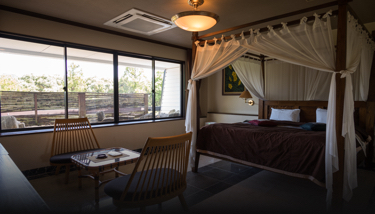 The room is a spacious one, ideal for relaxing.